If you’re a college student gearing up for Halloween tomorrow, we hope you’re scared. Not of the usual frightful fare—ghosts, haunted houses, terrible people who put their babies in pumpkins—but of the fact that your costume could get you in serious trouble. If this warning sounds freakishly familiar, it is. Over the years, FIRE has amassed a veritable witches’ brew of horror stories in which colleges and universities demand that students refrain from wearing “offensive” costumes. Public institutions violate the First Amendment’s guarantee of free expression when they do so. 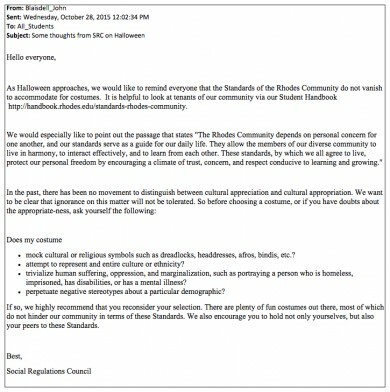 Courts have held that offensive—even racist—costumes and party themes are expressive conduct protected by the Constitution. (See Iota Xi Chapter of Sigma Chi Fraternity v. George Mason University, 993 F.2d 386 (4th Cir. 1993), which held a university could not punish a fraternity for an “ugly woman” contest that the university said created a “hostile learning environment.”) Private colleges, while not beholden to the First Amendment, often breach their own promises to support free speech on campus. As we’ve said before, universities are certainly within their rights to ask students to carefully consider costume choices, but threatening students with punishment goes too far. However, like some kind of recurring nightmare, these scare tactics materialize time and again. Suggesting students respect each other may not seem sinister. But FIRE’s experience demonstrates these friendly reminders are anything but. 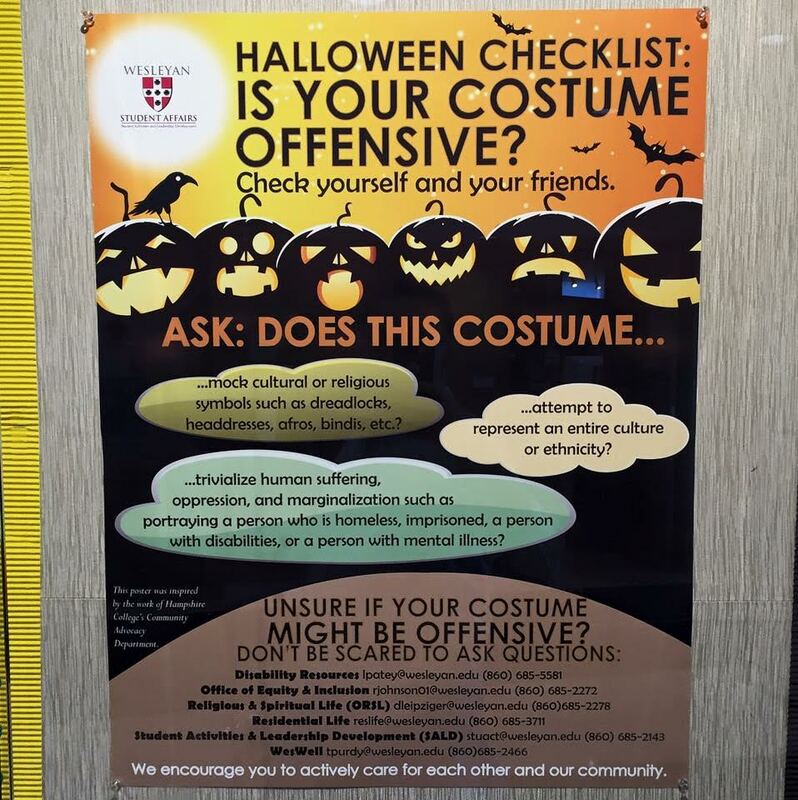 In other words, despite the flyer’s friendly tone, unintentionally hurting someone’s feelings with a Halloween costume could actually constitute a punishable offense at Wesleyan. Now, you don’t have to dust the cobwebs off piles of student handbooks to imagine ways that speech codes might, someday, be abused to stifle speech on campus. We’ve got plenty of hair-raising examples from years past. It’s kind of like the neighborhood kid who won’t just “TAKE ONE” from that unattended candy bowl on your porch. Someone always crosses the line. 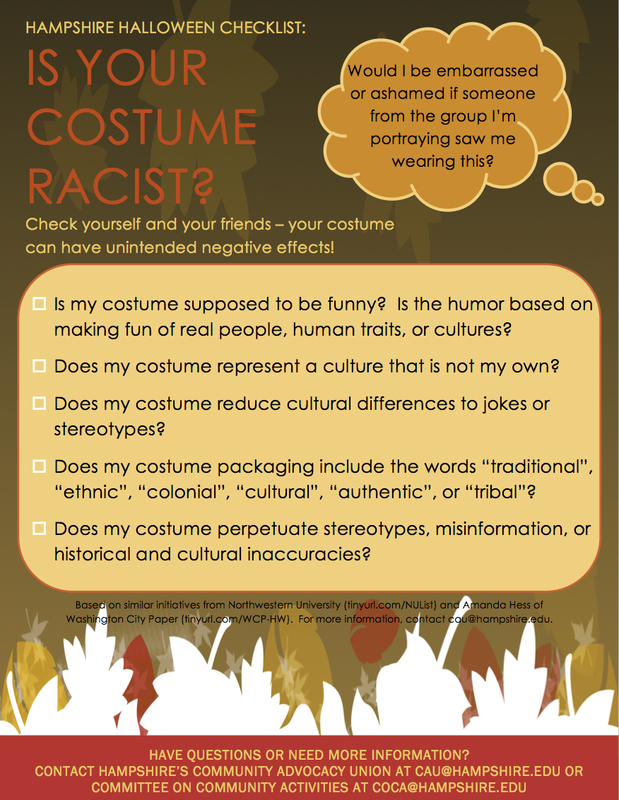 But that begs the question: What if students did use these offensiveness checklists to scrutinize their costumes? Would they be in the clear? 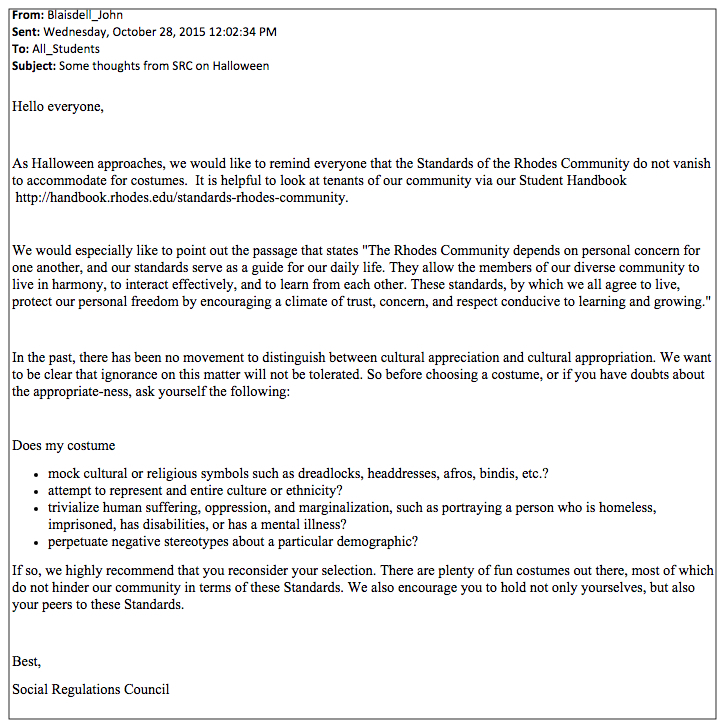 Investigations of Halloween costumes—even where they ultimately exonerate the accused—chill protected speech on campus. That’s why encouraging students to check themselves on Halloween—and backing that encouragement up with threats of disciplinary action—might just be the spookiest thing you’ll encounter this season.